2011 saw a record number of entries for the “Eight Annual Home of The Year Competition”. A panel made up of expert judges spent many hours reviewing design concepts and photos before making their decisions. A PLATINUM award from SRQ Magazine, Sarasota was given for the best remodel and renovation, in a town that boasts some spectacular properties. The winning 5500 square 1980s private beach -front home on Casey Key received a huge makeover to become a stunning coastal, contemporary environment satisfying the homeowner’s lifestyle and featuring their own modern furniture collection. The result of the remodel was the creation of a very special beach -front home which is exquisitely designed to include a new kitchen, dining, room, living room, home theatre, exercise room and new front elevation. The interior design was styled by Tanya Burley of Tanya Burley Design. 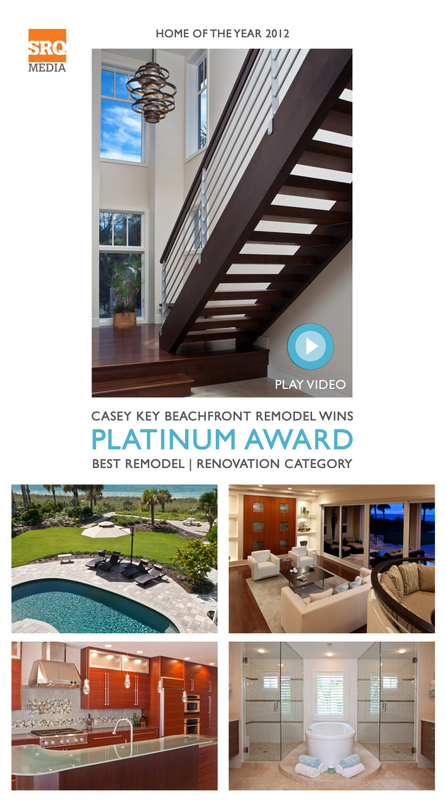 The Casey Key beach house is featured in Murray Homes’ promotional video which can be seen on You Tube at http://www.youtube.com/watch?v=Af3LcTKEjqE or http://www.murrayhomesinc.com/about-video.html. Steve Murray commented on the award “Murray Homes have always known that we build and remodel the best luxury, waterfront homes in Sarasota but to garner recognition for our work is fabulous”.